After a wonderful five month long summer, it is finally time to crack down and concentrate on my third/final year of University! During the majority of my summer break I have been thinking long and hard about ideas for what to base my Degree Project on… I could paint flowers? I could build a sculpture? I could work with projection? I could make something out of string? But I mean, who am I kidding?! Of course I’m going to concentrate on portraiture. For as long as I remember, I have always loved the elderly. Their faces intrigue me. The lines on their faces that tell me a story. The bags under their eyes that show me how tiresome their life has been. The smile on their faces that show me how grateful they are about the smallest of things. Their rough hands that have been through years of working hard. Over the past few years, I have found a great love towards drawing with biro pens, they make me feel more confident when it comes to producing art work. I like how I can’t rub out a mistake and I just have to work with what I am creating. 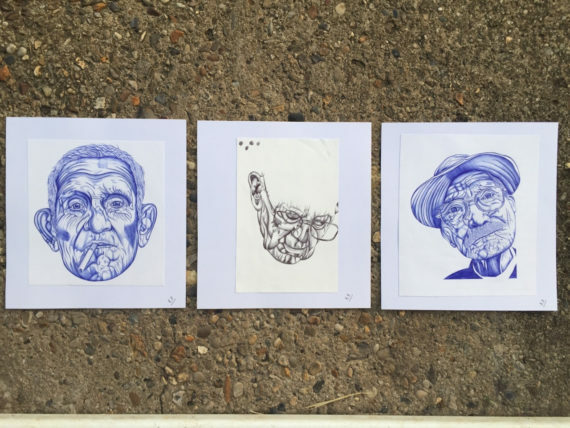 Recently, I came across Mark Powell’s work, he is an artist that merges 2 of my favourite things together – Drawing with biro pens and drawing the elderly. I have decided to begin my new sketch book for University with some artist research on Mark Powell and I am currently working on an artist study inspired by the artist himself. Now that I have began working on some ideas and drawings within my sketchbook, it is time to begin challenging myself and start thinking about going larger scale with the sizes of my drawings. It’s time to climb out of my comfort zone. Kim Anno is an American artist who studied at California College of the Arts, San Francisco. Anno is best known for being extremely talented in a variety of ways, ranging from painting and photography, to being a book artist and filmmaker/video artist who has exhibited by museums nationally and internationally. From 22ndMarch 2018 – 20thApril 2018, Kim Anno exhibited some of her paintings, photography, books and a video at the University of Suffolk Waterfront Gallery, titled ‘Nature Studies’. This art show was revolved around the delicacy of nature and Anno’s desire for her past, and how we choose to destroy nature today in order to make the world fit our desire, without a second thought about how we may be damaging our earth. Anno specifically chose particular paintings which were carefully selected by herself for this current exhibition, she developed these images which were captured in the 19thcentury and carefully made by steel engravings; This was a technique first introduced in 1794 by Jacob Perkins on copper metal for bank note reproduction in America. 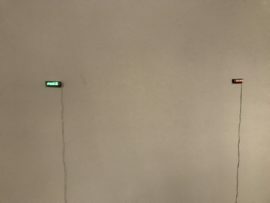 Kim Anno’s show at the University of Suffolk Waterfront Gallery consisted of 15 pieces of works which she had attentively narrowed down especially for this show. These chosen pieces of works involved 10 oil paintings, 3 photographs, 1 book and 1 video. The photography, books and video are part of an on-going project that Anno is planning to carry on working on and creating multiple pieces of art revolved around the same topic. This topic is based on ‘Men and Women in Water cities’, which was a social practice of art films and collaboration with local, coastal inhabitants, who are impacted by sea level rise and climate change, which was later turned into a book. Anno has travelled across the whole of the world, for her art practice, including the Northern and Southern California, Durban, South Africa, Miami, Florida and Santa Clara in Cuba, she wants her art project to travel to as many coastal communities as possible. The objective of this art project is involving young people from coastal areas in this world and widening their knowledge on the change of climate change which they have inherited from their parents’ generation (Wild projects, 2018). The exhibition was presented in a large room where the walls were pure white and the floor a slate grey, on the right hand side there was also a pop-up false wall which was there to section off a dedicated area for the video projection which Kim Anno was exhibiting. As you walked into the exhibition you are greeted by a plinth on the left hand side which offered free leaflets to the public, providing a little paragraph about Anno herself on the first page, and details about the work presented in front of you, including the titles of the work, the sizes, medium she used for those particular art works, and the prices. In the middle of the gallery there was a large table with a glass top, inside this had Kim Anno’s book ‘Men and Women in Water Cities’ which was laid out like a large leaflet so that the viewers could see some of the photography which is presented within her book. The ‘Nature Studies’ exhibition started on the left hand side, and the art works made its way around the gallery in a clock wise order. All of the work were labelled with numbers, and therefore it was easy to follow the work around the gallery in the correct order that Anno obviously wanted it to be viewed by observers. An extremely bold and outstanding piece of art that was presented at the exhibition was number six, which was named ‘Santa Rosa’, measuring 73.66cm x 50.13cm and was created using oil paints layered upon paper. It is a magnificently painted picture with a black and white back drop, layered with bright and beautifully coloured oil paints, however it is not obvious as to what tool Kim Anno uses to create her paintings, whether she may use a paintbrush or a palette knife. Although, with the smoothness of the oil paints, most may assume that she must use a paintbrush to create her art works. Her art work is very much revolved around colour, texture and space, as well as the main theme being nature. Overall I found that Kim Anno’s exhibition at the University of Suffolk waterfront gallery was really interesting and her dedicated theme of nature was portrayed brilliantly through her use of natural colours and shown through the art works she chose to present for this particular show. There were multiple highlights for me at this exhibition, including number 4, ‘North by south (Fisherman)’, and number 7, ‘Venice’, I thought the colour of oil paints that she chose to use in her paintings really helped compliment the monochrome backgrounds. I always find that art work that is extremely different to what I create, tends to capture my eye more than work similar to my own, therefore Anno’s work is really intriguing to me and I thoroughly enjoyed seeing her exhibition. A big and scary time is approaching… It’s time to start my degree show planning! 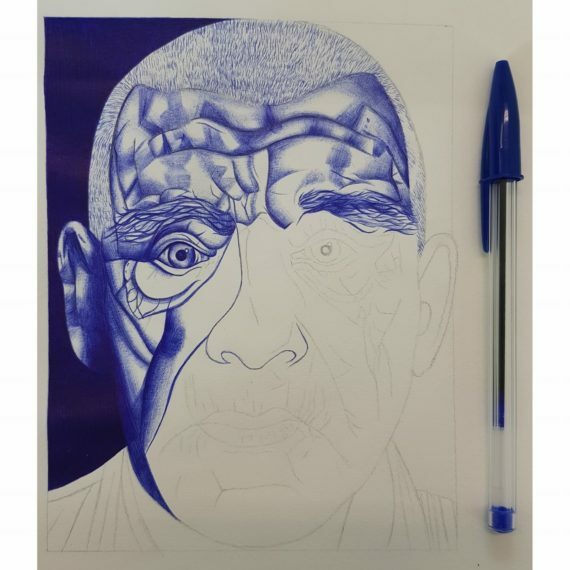 I have finally completed my 6ft biro drawing of my Dad’s portrait, which I am extremely proud of, and I plan on that being the main focus of my degree show. My current plan for my final bundle of work is all dedicated to my Dad, because he is a very big part of my life and has had to deal with a lot through his life time but he still manages to pull through every day with a smile on his face and is such an inspirational cataracter. He is my hero. I am currently working on smaller detailed drawings of things that remind me of my Dad, including Flamin’ Hot monster munch which I have just finished drawing (the image below shows the finished drawing). I wanted to draw items that remind me of my Dad to help give the viewers an idea of what sort of character my Dad is and just how sentimental he is as a person. I plan on having an area that involves 3 walls shaped as a rectangle for my degree show, the centre wall I want to have the 6ft drawing of my Dad placed so that it is the first thing you see as you walk in my dedicated area. Then on one wall I’d like to have a set amount of small detailed biro drawings of the items that remind me of my Dad. On the third wall I plan to have a piece of writing about my Dad that I have written, to help the viewers gage an idea of who the man is in the photos, and hopefully the writing will help to pull everything together for my degree show. 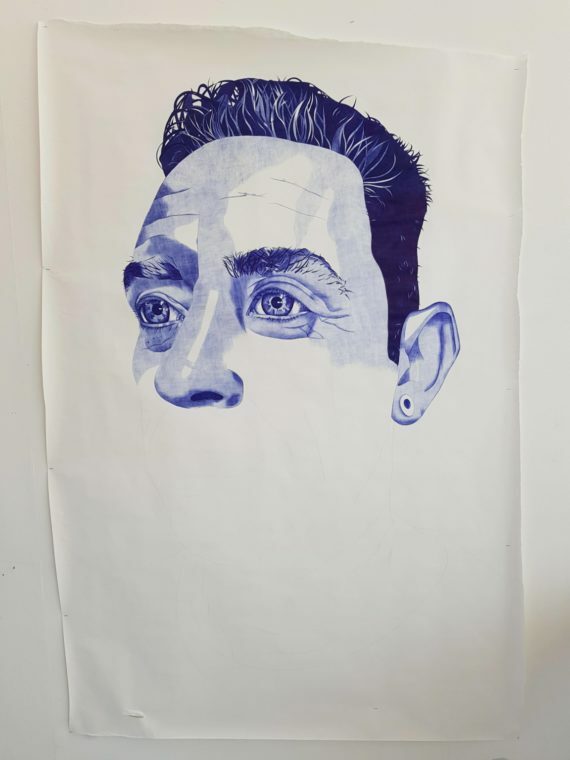 Originally I did plan on doing some screen prints of my fathers face, instead of a piece of writing, however after having a one to one chat with my tutor, we realised that the viewers would have no idea who that person is in my drawings and they probably wouldn’t care. However, if I were to do a piece of writing about my Dad it would be more heartfelt and that would help the viewers feel a bit more involved and engaged with my art work. I am really looking forward to planning further for my degree show. Only 2 months left of university, how scary! 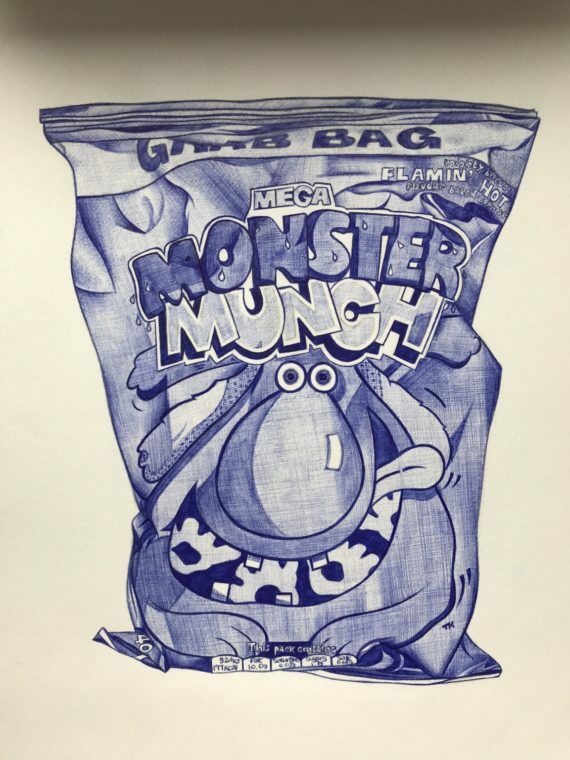 Below is a photo of my first drawing of an item that reminds me of my father – Flamin’ Hot monster munch drawn in biro pen! 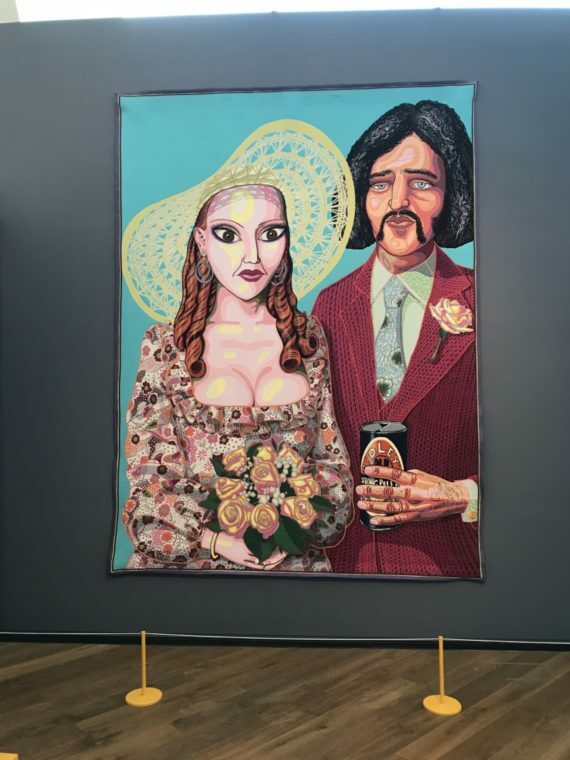 On Friday 16th February I went on an art trip to the Firstsite Gallery in Colchester with my university peers to see a show presenting the work by Grayson Perry and Rose Finn-Kelcey.Grayson Perry is one of Britain’s best-known contemporary artists. He often works from his memory, basing them on growing up through his childhood. He works in a range of mediums, from iron, bronze, printmaking and also ceramics. 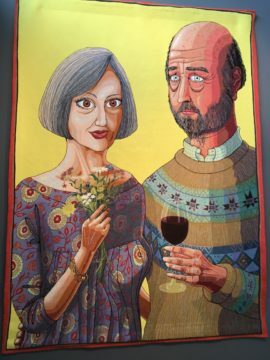 I really enjoyed looking round this art gallery, it is the first time I’ve ever visited Firstsite and I was particularly drawn to the work by Grayson Perry. I loved the detail within the large art work by Perry and the bright colours of thread he had chosen. 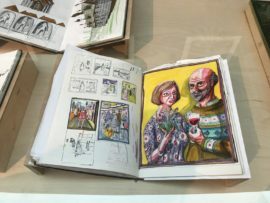 Below is a photo I took of one of my favourite pieces of work he had on display, I learnt that he makes small sketches in his sketchbooks then he has a company who enlarges this for him, he doesn’t stitch the works himself. 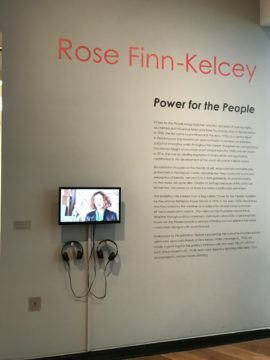 I also really enjoyed looking through the work of Rose Finn-Kelcey, who unfortunately is no longer with us today so the show was accompanied by two of her close friends. I particularly enjoyed looking at her work because it is something very different to how I work, her art was very focused on empowerment and personal identity. A lot of her work was digital, including a large slot machine where you enter 20p and receive a prayer, and then once that prayer is finished, you get your 20p back! Below I have attached a photo of some of Rose Finn-Kalcey’s work. I want to challenge myself. I need to stop sticking to the same frame of work and throw myself in the deep end. People just expect a certain style of art from me; They know what I’m going to produce, and they know that I’m just going to draw small detailed portraits using biro pen. Why is that so wrong? Should I be mixing up my art work more? Am I not allowed to have my own style? Am I not allowed to stick to using the same media? I’m not really sure. All I know is that I love working with biro pens, and people aren’t surprised by my art work anymore. I want to shock people. I want a positive reaction from people. I want people to gaze at my drawings in amazement. This is why I am challenging myself to not only one, but two 6ft drawings. Yes, of course I am drawing them using biro pen, but I’m not drawing them A5 size… I’m drawing them 6ft! I want people to walk into a building and be able to see my drawings from the other side of the room. I want people to stand back and admire my drawings in awe and admiration. I want people to be able to see all of the time and effort that I put into my drawings. I have 7 months to produce these two portraits of my Dad. 7 months to show everyone that I CAN push myself. 7 months to astonish everyone. I like my style of art, and I am extremely proud of how far I have come since I first started drawing with biro pens 5 years ago, so why do people still want me to differentiate my artwork? Is becoming an artist about discovering your one love towards a particular media or style? Or is being an artist about forever experiencing new techniques and mixing up styles? Am I even an artist? I want to be my own person. I want to produce the style of art I want to produce. I want people to stop asking questions about my art and just look at it. I want people to stop telling me what I ‘should’ be doing differently. I will improve myself. I will become a better artist. I will show everyone that I can do better. I will draw larger. I will make people enjoy my art. I will work harder. I will draw for longer. I will spend more hours at University. I will complete these two portraits. I will show everyone I can work larger. I will challenge myself. I will graduate University with a Fine Art degree. I will succeed.